You can’t go wrong with an Ina Garten recipe and this one is a keeper! I was making Greek chicken kebabs for dinner recently and wanted a veggie loaded salad to pair with them so I went in search some inspiration online and found this recipe on the Food Network that looked perfect! I kept fairly close to the recipe but used vine ripened tomatoes and a bit less oil. I loved the big chunks of veggies with the tangy vinaigrette and it paired so nicely with the kebabs. 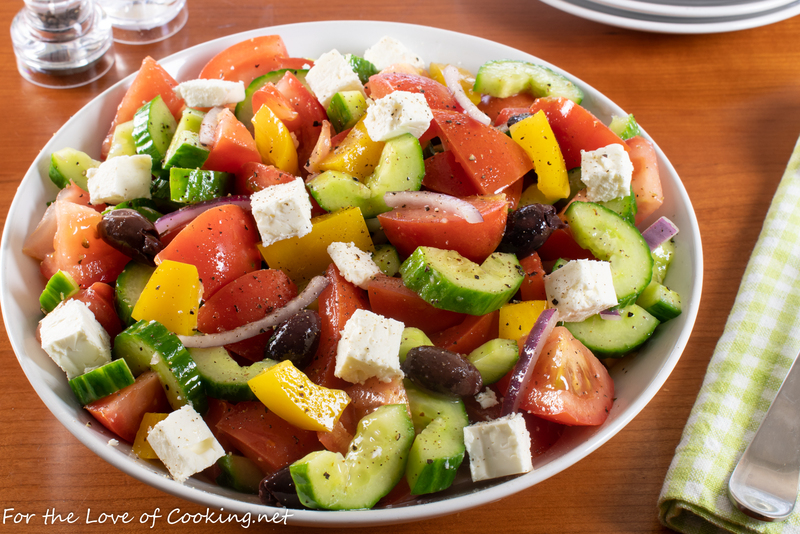 Place the tomatoes, cucumber, bell pepper, and red onion together in a large bowl. Make the vinaigrette by whisking together the vinegar, minced garlic, minced oregano, and Dijon mustard in a small bowl. Slowly add the olive oil to make an emulsion. Taste then season with sea salt and freshly cracked pepper, to taste. Pour the vinaigrette over the vegetables in the bowl. Add the feta and olives then toss lightly. Set aside to allow flavors to mingle for 30 minutes. Toss before serving and add a bit of freshly cracked black pepper, if desired. Serve. Enjoy. Make the vinaigrette by whisking together the vinegar, minced garlic, minced oregano, and Dijon mustard in a small bowl. Slowly add the olive oil to make an emulsion. Taste then season with sea salt and freshly cracked pepper, to taste. Pour the vinaigrette over the vegetables in the bowl. 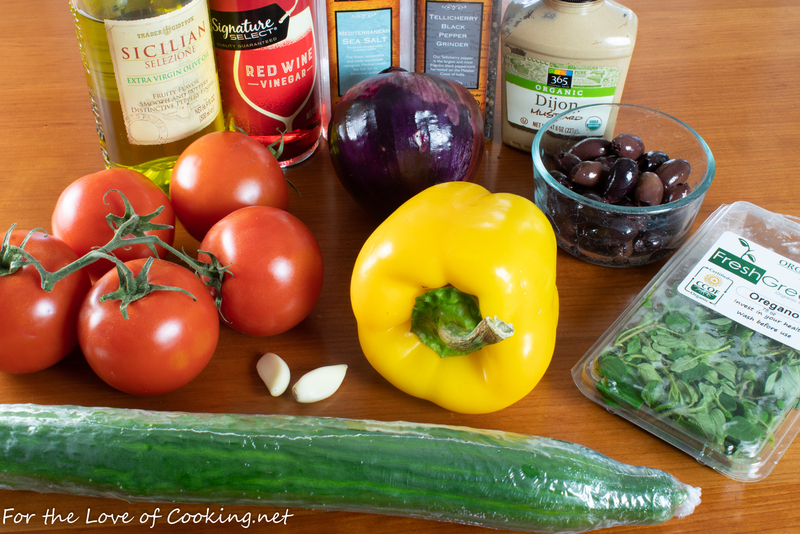 Add the feta and olives then toss lightly. Set aside to allow flavors to mingle for 30 minutes. Toss before serving and add a bit of freshly cracked black pepper, if desired. Serve. Enjoy. What a perfect salad! Gorgeous colour and flavour! 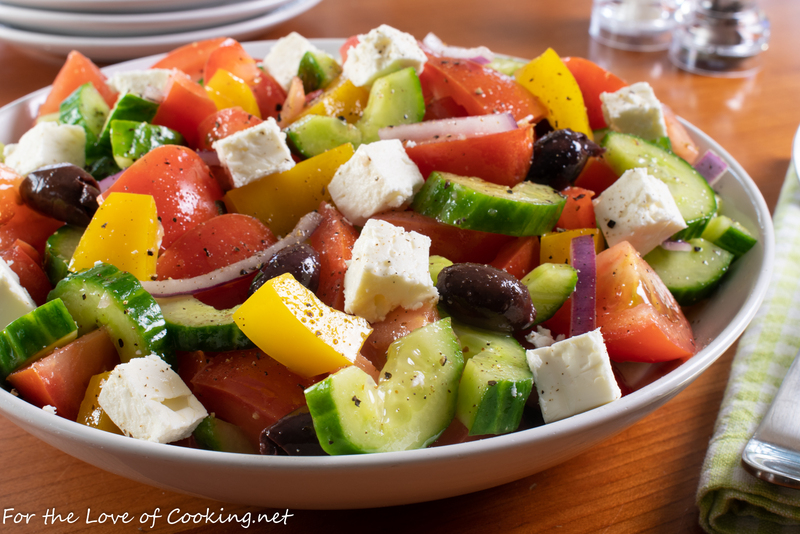 I’ve been craving a good Greek salad lately, and you’re totally right – you can’t go wrong with an Ina recipe!! Looks good Pam and when SIL Pat came back from her Greek vacation a few years ago, she advised that the salad had no lettuce but looked just like yours. 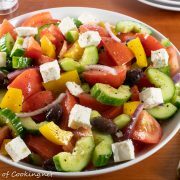 Love Greek salad! And yours looks over-the-top good! So many neat flavors, textures, colors — terrific stuff. Thanks! Wow! That looks so pretty and tasty!! Will definitely try it soon. Thanks for sharing! Absolutely not – my all time favorite salad. Will have to try your version.